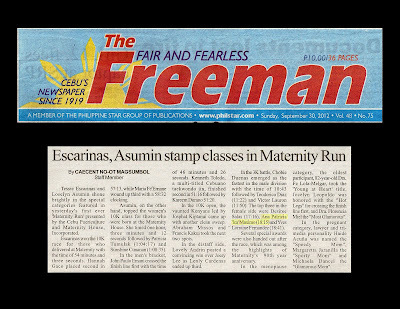 CEBU, Philippines - Tessie Escarinas and Loselyn Asumin shone brightly in the special categories featured in yesterday's first ever 'Maternity Run' presented by the Cebu Puericulture and Maternity House, Incorporated. Escarinas won the 10K race for those who delivered at Maternity with the time of 54 minutes and three seconds. Hannah Gaco placed second in 57:13, while Maria Fe Ernane wound up third with a 58:32 clocking. Asumin, on the other hand, topped the women's 10K class for those who were born at the Maternity House. She timed one hour, three minutes and 12 seconds followed by Patricia Tumulak (1:04:17) and Sunshine Cunanan (1:08:35). In the men's bracket, John Paulo Ernani crossed the finish line first with the time of 46 minutes and 26 seconds. Kenneth Toledo, a multi-titled Cebuano taekwondo jin, finished second in 51:16 followed by Kareem Durano 51:20. In the 10K open, the vaunted Kenyans led by Josphat Kiptanui came up with another clean sweep. Abraham Missos and Francis Kakui took the next two spots. In the distaff side, Lovely Andrin posted a convincing win over Joery Lee as Lenly Cardenas ended up third. In the 3K battle, Chobie Duenas emerged as the fastest in the male division with the time of 10:43 followed by Teodorico Diaz (11:22) and Victor Lauron (11:50). The top three in the female side were Desiree Salas (17:16), Ana Patricia 'Ica' Maximo (18:15) and Yves Lorraine Fernandez (18:41). Several special awards were also handed out after the race, which was among the highlights of Maternity's 90th year anniversary. In the menopause category, the oldest participant, 82-year-old Dra. Fe Lola-Melgar, took the 'Young at Heart' title, Jocelyn Leopoldo was honored with the "Hot Legs" for crossing the finish line first, and Dra. Florencia Miel the "Most Glamorous".